DPCI worked with PRIMEDIA to design and develop a multi-channel publishing platform that consisted of Digital Flywheel and Adobe InDesign Server integrated with Adobe LiveCycle, EnterMedia digital asset management system and DataPlan's Journal Designer to provide self-service creation of print and Web advertisements and books. PRIMEDIA Inc. is the parent company of Consumer Source Inc., a national publisher and distributor of free print and online consumer guides for the apartment and home industries. PRIMEDIA distributes more than 20 million print guides and magazines - such as Apartment Guide® and New Home Guide - to approximately 50,000 locations across the United States each year. 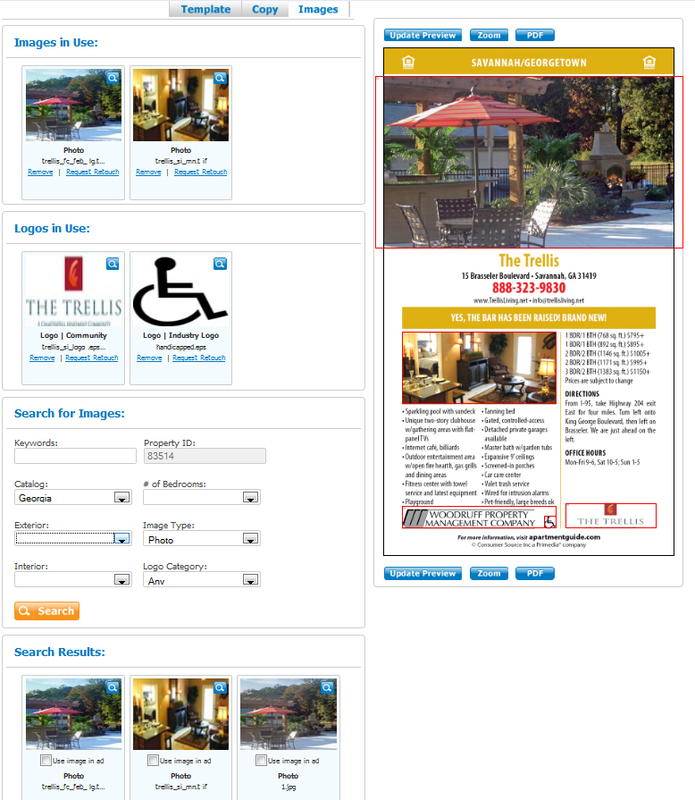 In addition to print guides and magazines, PRIMEDIA owns numerous Websites including apartmentguide.com, newhomeguide.com and rentals.com. To support its print and Web operations, PRIMEDIA’s personnel – account executives, publishers, and production teams – used many different systems to manage contracts, ad copy, images and other aspects of the ad creation and publishing process. These systems were not integrated, and the workflow involved was time-consuming and costly. Additionally, personnel spent too much time on production activities, often entering the same information twice for an ad to run in both print and Web formats. PRIMEDIA sought a solution partner with subject matter expertise to help build a platform to simplify and integrate editorial and production processes – from the creation, review and output of print publications to providing content to the various Websites. DPCI worked with PRIMEDIA to design and develop MyAds, a multi-channel publishing platform that allows PRIMEDIA customers and staff a way to create, edit, and approve both print and Web-ready real estate advertisements. The MyAds platform includes integrations with PRIMEDIA’S digital asset management system, as well as other business applications, such as PRIMEDIA’s customer relationship management, contract management, and product fulfillment systems. With MyAds, account executives now have more control over the publishing process without compromising quality or consistency. At the center of the MyAds platform is DPCI’s Digital Flywheel, an online publishing tool integrated with Adobe InDesign Server. DPCI integrated Digital Flywheel on PRIMEDIA’s behalf with Adobe LiveCycle, EnterMedia and DataPlan’s Journal Designer. MyAds provides comprehensive self-service tools designed to simplify the process of creating both Web listings and print ads. New tasks such as contract association or customer ad approvals are assigned to account executives through LiveCycle and each task is accessible through the integrated MyAds dashboard. Next, using the MyAds elegant interactive user interface, account executives can easily input text and images to create Web listings and print ads for customers. With Digital Flywheel and a library of pre-defined, publishing-ready InDesign templates, account executives now can create print ads via a Web browser, without any technical expertise in Adobe InDesign. Now that account executives can create print-ready ads on their own, PRIMEDIA’s design and production staff resources are free to focus on more creative tasks. “We were spending so much time just building ads and making corrections that we never had time to enhance the quality of the layouts and ad designs we offer our customers,” said Annie Ridder, Customer Service Manager at PRIMEDIA. Using Adobe LiveCycle, account executives initiate requests for tasks such as photo retouching or new design templates that are not part of the MyAds template library. Once account executives complete the Web listing and/or print ad for a property in their market, LiveCycle routes a PDF to the customer for review and approval. 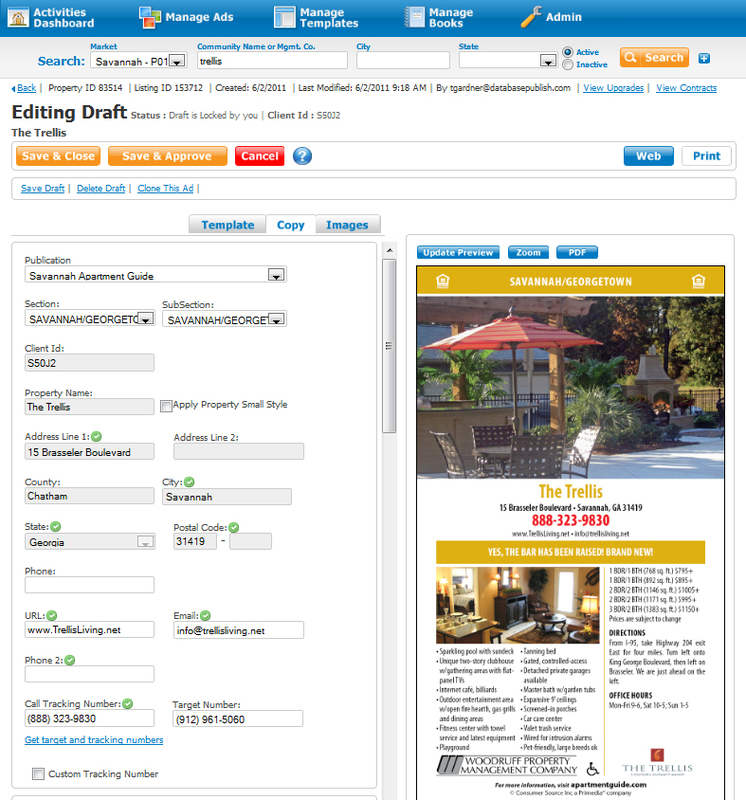 Using LiveCycle, customers can review and annotate print ads electronically. The LiveCycle system keeps an audit trail of the customer’s feedback and approval for PRIMEDIA’s records. Account executives then are alerted of the customer’s feedback and make the appropriate modifications to the ads based upon the customer’s annotations. DPCI implemented EnterMedia, an open source digital asset management system, to allow PRIMEDIA to store all templates, property images, stock photos, logos, and approved ad PDFs in one central repository. DPCI integrated EnterMedia digital asset management system directly with Digital Flywheel for the MyAds platform. 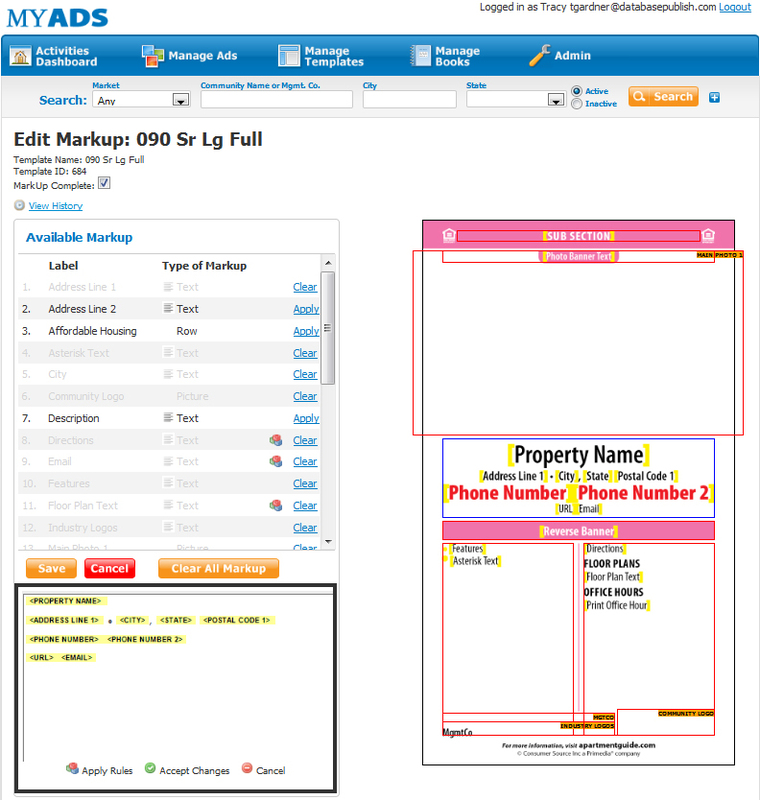 Thus, all images and templates can be accessed by MyAds users through one single user interface. The account executives at PRIMEDIA are organized by regions of the United States, within which multiple ad books are published. Each region has a publisher that oversees ad sales and book pagination processes. 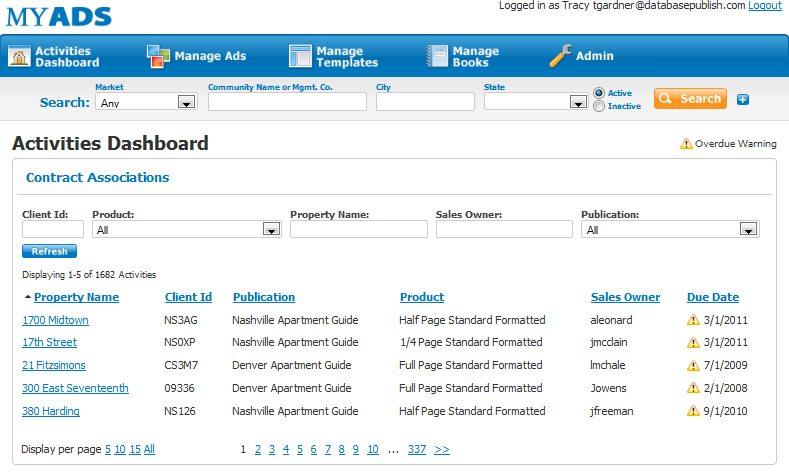 Once all print ads have been created and moved through the LiveCycle approval process, the region’s publisher selects a market from the MyAds Book Management interface in order to begin the pagination process. DPCI integrated MyAds with DataPlan’s Journal Designer, transmitting all of the necessary data via Web services to create the individual ad book. This data includes ad references, house ad or ‘filler’ information, region/market information, and other pertinent metadata. Publishers and/or production resources can then refine the pagination in the form of a flat plan using Journal Designer’s client interface so as to produce the final book output file. PRIMEDIA’s MyAds dynamic publishing system provides a multi-channel, self-service Web portal for authorized staff and customers to create, publish, and proof all types of ads. The browser-based system includes tools and templates to customize text and images, and apply sophisticated formatting rules – all via a single interface. This reduces the time it takes to create an individual ad from days to minutes – all while capturing an audit trail of work history and signoff/approval. With MyAds, the power and control for creating ads and obtaining approval is in the hands of account executives, significantly reducing errors caused previously with multiple sources of data. It also reduces the number of resources needed to complete the design and production processes for Web listings, print ads and ad books. PRIMEDIA can leverage the MyAds platform for the creation of both Web listings and print ads, sharing text and images between these channels, so that account executives no longer have to input data and images twice. Through the implementation of MyAds, PRIMEDIA has a strong set of enterprise tools to improve operational efficiencies. The extensibility of the technology platform implemented by DPCI also gives PRIMEDIA many different options for future expansion and feature enhancements. “DPCI’s domain expertise helped us consolidate our publishing activities and streamline our processes,” said Mike Child, CTO at PRIMEDIA. “The resulting system not only provides a higher quality product and enhanced customer satisfaction, it also has helped reduce the costs associated with publishing content to multiple mediums."